Of the career of the Learned Pig, as can be seen on this blog, a great deal is known, but what of his erstwhile companion, the Learned Goose? 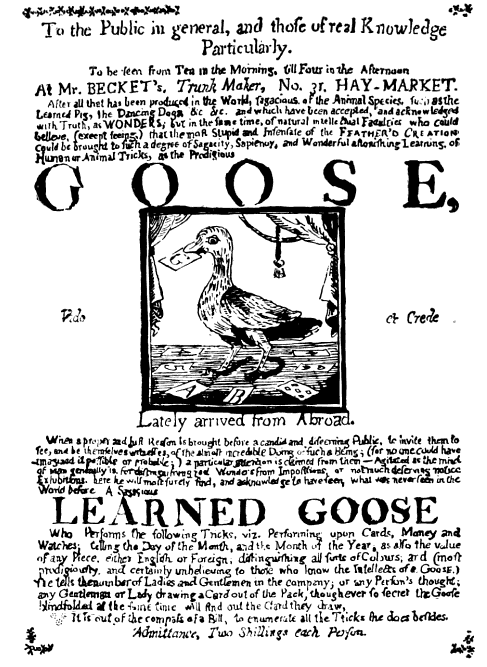 As it happens, the Goose was the very first of all educated animals to appear on the public stage in the wake of Toby's success; this early handbill, reproduced from one in the collection of Harry Houdini, dates to 1789, just a few years after the Learned Pig's London appearances. As was said of Toby, our cultivated Quacker has "lately arrived from abroad, and -- this is most Singular -- also spelled out answers to questions from the audience using letters printed on paste-board cards! It further mimicked Toby's act by telling time by watches, distinguishing colors, and reading minds, even while blind-folded. 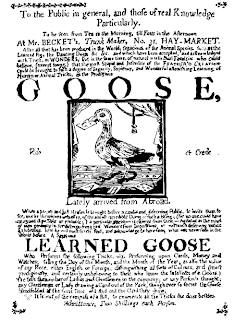 Houdini used the history of this goose to partly discredit the mind-reading act of Robert Houdin, arguing that it was simply by employing a variety of signals, and trained habits, that anyone -- or any animal -- could succeed in deceiving an audience into believing that minds had been read. No doubt that's an accurate judgment. But what of our friend Goose himself? What are his particulars, whence went his career, and might not he also have left behind some kind of memoir? The handbill here seems to the be first, with the goose at Mr. Becket's, Trunk-Makers, at No. 31 Hay-Market. A second bill, reproduced in Christopher Milbourne's Magic: A Picture History, has the goose at No. 5 in the Pantechnicon Arcade, Belgrave Square (Milbourne suggests this show was in fact earlier, though he also dates it to 1789). And then, also in his book, we have a handbill for Sieur Rea and his "Curious Birds" -- "called Minous, alive from Botany Bay" -- at the Town Hall in Weymouth in 1810, with a woodcut that shows them manipulating playing cards! It seems clear that the same kind of public fascination audiences felt for learned pigs could very easily be transferred to learned birds, with much the same act and many quite similar rhetorical flourishes. PETITIONS OF THE LEARNED GOOSE AND LEARNED PIG. OBSERVING that you have recently admitted a plea in behalf of animals in the person of a Post Horse, two of us, some of whose species have borne the appellation of learned, have made choice of your publication as a medium of conveyance of our respective claims upon the world at large. What the outcome of this petition may have been the Sportsman's Magazine gives, alas, no indication.